They look sooo tasty, much more appetising than shop bought!! Happy New Year. What a lovely mix: peppermint and cinnamon. Bet they tasted scrummy. Hope you soon get your kitchen back in shape. Those marshmallows look awewome. Hope your kitchen and craft room are all ship-shape real soon. Wish mine were! Happy New Year – you’re right – it’s good to be back to normal! I know, it will be Valentine’s Day soon! I’m already thinking…hearts! LOL yes, you’re so right. I get going in there and it’s hard to stop. However, I’ve found more wonderful things there, stuff I never would have seen. It’s been sort of a breath of fresh air as far as inspiration. Wow, peppermint and cinammon sounds amazing. I agree, holidays are fab but getting back into the groove is good too. yes lovely to get back to normal and get the house tidy again, ready to mess up with more craft stuff! 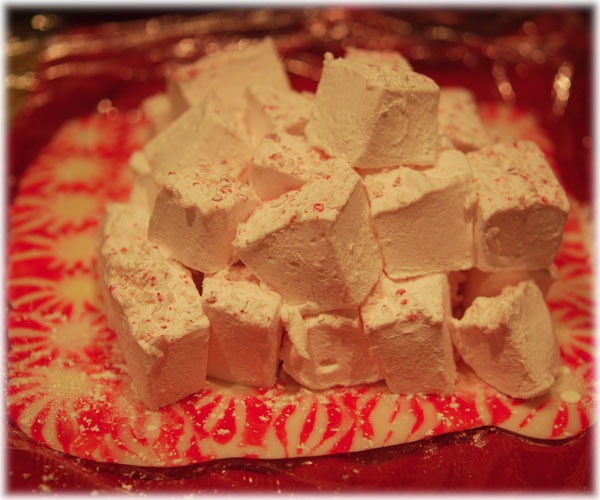 I was surprised how nice the crunch of the peppermint candy crumbles was on the peppermint ones. I’m going to try some other options too. Now that the kitchen is back together I have a few more ideas. I’ll share them when I do. These are honestly not very difficult, altho they take a little time (mostly setting up time). And everyone I gave them to was very very impressed. What a fab picyure – really lifts the spirits and makes my mouth water! I have to admit I haven’t ventured into Pinterest, I am thinking I spend so much time discovering blogs what would happen if I went there as well!!! It is a time consumer! But, to be honest I usually spend only a little time at one time on it. You could easily spend a lot, but I generally find a few things and then do something else. And I have discovered many new and wonderful ideas! Hello ! You’re right, Christmas time is fantastic but the normal life is great too !!! lol ! Love your imge, i would like to eat this, seems so yummy !